We’d love your help. Let us know what’s wrong with this preview of The Psychology of Judgment and Decision Making by Scott Plous. To ask other readers questions about The Psychology of Judgment and Decision Making, please sign up. Let’s say you have been reading some of my recent reviews of Blink, Made to Stick and The Wisdom of Crowds and you’ve thought, “Were there but world enough and time…” Well, now there is. For the trivial investment of 260 pages you will find this book presents much of the research that was fascinating in those books in a quick and lively style. This really is a great book and one which will leave me thinking for quite some time – just as the research detailed in it has fascinated the authors of t Let’s say you have been reading some of my recent reviews of Blink, Made to Stick and The Wisdom of Crowds and you’ve thought, “Were there but world enough and time…” Well, now there is. For the trivial investment of 260 pages you will find this book presents much of the research that was fascinating in those books in a quick and lively style. This really is a great book and one which will leave me thinking for quite some time – just as the research detailed in it has fascinated the authors of the books mentioned above. We then move from individual perception in the first chapters through to group and social judgements. The point of all this is to show how these can be skewed by various prejudices and biases. This was something I liked about this book. Often, I find, psychology annoys me because the results of their little tests are presented a bit like the end of a magic show. There is only one person in the room that knows how the trick was performed and everyone else is left to feel a little stupid. In this book the questioning of judgement and decision making is not just a questioning by those wearing white coats smugly (if not sneeringly) looking down on we lesser mortals – but rather a general concern for the possibility of objective judgement at all. The fact the book ends with a reference to Gödel’s Incompleteness Theorem certainly won my heart. The book also ends with another disturbing test, where researchers were asked to test rats that had been breed to be either great at going through a maze or completely hopeless at going through a maze. The researchers were left to see how the rats went – and those told the rats were very clever at mazes find results that showed they were 50% better than the dumb rats. The only problem was that the rats were all just rats, put into one or other of the groups totally at random. What I like most about this experiment is that it is almost an exact duplicate of one in The Hitchhiker’s Guide to the Galaxy - where we think we are testing rats, but actually, the rats are testing us. There are incredibly disturbing biases detailed in this book – a few of them you may have heard of before, others you probably have not. One of the most interesting was around who you sit facing can bias who you think is most influential in an argument. Another that I will think about much more is the idea that we are much more likely to think that other people do the things they do because what they do represents their disposition, whereas we do what we do because of the situation we are in. This distinction is fascinating. In my job I represent people who have gotten themselves into some sort of trouble. I had never released it (would not have been able to put it into so many words) that there is a fundamental bias during these meetings that whatever the person has ‘done’ is due to a bad character. In fact, often it may be due to circumstance. The current furore over Ginnie may be a case in point. I cannot excuse her plagiarism, but I also worry about the limits of righteous indignation. I find the whole thing unspeakably disheartening and terribly sad. This also has my favourite psychological ‘test’. The one where a group of seminary students are asked to give a talk on the Good Samaritan, but are told that the talk is to be given somewhere else on the university. Along the way someone is clearly in distress and it turns out that people who are studying to become religious leaders and preparing to give a talk on one of the key examples of how someone should behave in such a circumstance, are not more likely to help the poor person in distress any more than the rest of us slobs. In fact, the main factor determining whether they stopped and helped was how much time they thought they had. Some even stepped over someone clearly in distress rather than be late to give a talk on the Good Samaritan. At the start of the book the author talks about deception used in psychological experiments and states that the “American Psychological Association has established a set of ethical guidelines to protect subjects in the event deception is used.” This includes “that any use of deception be explained after the experiment is over.” Oh dear – imagine what it must have been like telling the seminary students they had stepped over a person in need to give a speech on the Good Samaritan! It is almost too embarrassing to contemplate. I have come away from this book much more concerned than previously about the quality of my ability to judge situations, but also with a range of techniques that potentially will help reduce these biases. I’ve also come away with a reading list of references that I am looking forward to tracking down. This really is a fascinating subject as this is also a wonderfully fascinating book. 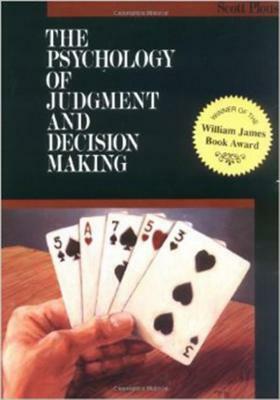 Hands down the best introduction/overview of judgment and decision making that's out there. Although it was published in the 90's and so neglects a great deal of the more modern work, it gives a solid background of the classics, and prepares the reader for more advanced readings. I do research in this area for a living, and often friends, family, or people who see my talks ask me what they can read to learn more about the topic - this is the one I always recommend. Accessible to all levels, but Hands down the best introduction/overview of judgment and decision making that's out there. Although it was published in the 90's and so neglects a great deal of the more modern work, it gives a solid background of the classics, and prepares the reader for more advanced readings. Very good information on decision-making biases and errors that everybody makes, citing many many social psychology studies and showing some very surprising results. Selective perception, cognitive dissonance, memory and hindsight biases, context dependence, anchoring biases, and more categories of decision-making troubles are covered in a not-too technical and lightly entertaining way. Accessible and succinct, well-documented and well-reasoned, Plous' work is an engaging read for anyone interested in how and why we react the way we do, regardless of the reader's knowledge of psychology. I wanted a quick and easy overview of biases in decision making, and that is exactly what I found in this book. My only comment is that it was published in 1993, and I wonder if there have been any new developments in this area since then? An entertaining book but very clearly outdated and aimed at a US reader. For a more up to date take on biases in the human mind, check out "Thinking Fast and Slow". A very enjoyable and brisk 250 pages, I think that over time, I will also find this book very useful. With each chapter, this book takes a related family of "decision making biases" and describes the often humorous experiments that revealed them, talks about whether they are thought to be a problem in real life, and suggests strategies to mitigate their effects. The book also does a great job of explaining the very important idea of heuristics. I recommend it to everyone because of its quality a A very enjoyable and brisk 250 pages, I think that over time, I will also find this book very useful. With each chapter, this book takes a related family of "decision making biases" and describes the often humorous experiments that revealed them, talks about whether they are thought to be a problem in real life, and suggests strategies to mitigate their effects. The book also does a great job of explaining the very important idea of heuristics. There are many subconscious methods through which we arrive at the decisions we make. Understanding how these work, and bringing these methods to a conscious, analytical conceptual basis will improve our analysis of events and our ability to adapt to them. The best section is the one on biases and heuristics, which describe how we use (frequently unexamined) mental shortcuts that often achieve sub-optimal results. Recommended to Rebecca by: Lori S.
I know this makes me an even bigger nerd, but a fellow accounting doctoral student friend recommended this book to me when I was at a conference a couple of weeks ago, and it just arrived today! She said it was very readable and interesting, as well as a good scientific overview of JDM (judgment and decision making) research in psychology. I am definitely looking forward to reading it for helpful theories to integrate into my dissertation. A must read for everyone involved in the fields of psychology and marketing. It's narrative is clear, easy to follow and understand and provides an excelent framework for what nowadays cognitive science stands about perception, memory and the way we "think". Excelent for understanding leadership, team-building, risk handling, error making, etc. Attempts to understand brainwork and - which is more - spot flaws in it using brainwork may look like relying on speed in chasing your own tail. Nonetheless, like there are places in universe where you can literally see your own back, there are ways to get the hang of the tricks your brain tricks you into. 2. Do a find "you" replace with "decision maker"
Really good book, it'll change your life... you just have to fight your way through. It reads more like a text book. Great book on thinking through decisions. A great work on the contextual, personal, social, and cognitive biases and factors in decision making. Great work! Good senior undergraduate level introduction to the field. Slightly dated, but still reliable given notable degree of cross-over with 'Thinking Fast and Slow'. Solid introduction to judgment and decision making. Focuses a bit too much on the social aspects, but that's understandable because it makes it more accessible to a broader audience. Great look at a lot of factors that influence judgments. The section on attribution theory was especially enlightening. "THE" survey book on cognitive bias. Extremely good. Scott Plous, Ph.D., is a Professor of Psychology at the Department of Psychology of Wesleyan University. He is also a Faculty Associate of the Tufts University Center for Animals and Public Policy. His areas of research include the psychology of prejudice and discrimination, decision making, and the human use of animals and the environment. In 2001, he published a study that evaluated the reliability of Institutional Animal Care and Use Committees (IACUCs), and found that animal testing standards in the United States are widely inconsistent across different research institutions.